Phuket Air offers daily flights to Phuket and the journey takes only 1.20 hours. Call 02 6798999 or visit www.phuketairlines.com for more details on flights. Bangkok Airways has daily flights connecting Phuket with Pattaya and Samui. For more information, contact their Bangkok office at tel. 66 2265 5678. Reservations can be made at tel. 66 2265 5555. Alternatively, browse its website at www.bangkokair.com for more flight details. One-to-Go by Orient Thai operates a daily flight between Bangkok and Phuket. The flight time is 1.20 hours. Call 1126 or visit www.onetwo-go.com for more information. Air Asia also offers several daily flights connecting Bangkok and Phuket. The flight time is 1.20 hours. Visit www.airasia.com or call 02 5159999 for reservations. Nok Air has several daily flights between Bangkok and Phuket with a flight time of 1.20 hours. Visit www.nokair.com or call 1318 to make your reservation. There are several direct flights between Phuket and international destinations, e.g. Kuala Lumpur, Hong Kong, Penang, Singapore, and Sydney. Dragon Air, Malaysia Airlines, Silk Airand Singapore Airlines also operate international flights connecting Phuket with other destinations. Please call airline offices for more details. Phuket International Airport is located approximately 30 kilometers north of the city, tel. 076 327230. Taxis between Phuket City and the airport costs approximately 400 baht but the fare to the beach ranges between 500 baht and 600 baht (The rate may decline now). Minivans charge approximately 80 baht /person to town, but 120 baht/person to Patong, Kata and Karon Beaches. Phuket Limousine (tel. 076 248596), located approximately 1 kilometer west of the city, operates hourly shuttles to the airport from 6.30 a.m. to 7.30 p.m.
Air-conditioned and non air-conditioned buses leave Bangkok's Southern Bus Terminal for Phuket several times daily. Trips by air-conditioned bus, which normally leaves in the evening, take about 13 hours. Call 0 2434 7192, 0 2435 1199 or visit www.transport.co.th for more information. There is no direct train service to Phuket. Travelers arriving by train must get off at Phun Phin Railway Station in Surat Thani Province and continue by regular bus to Phuket. For more information, call the State Railway of Thailand, 1690, 0 2223 7010, or 0 2223 7020. 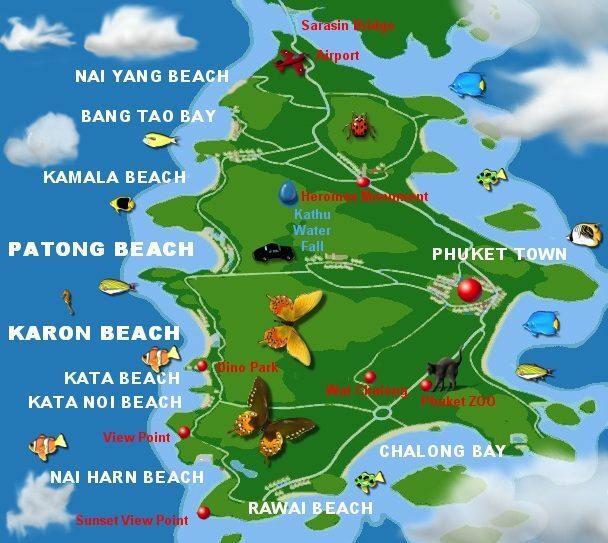 During the high season, travelers may opt to get to Phuket from Ko Phi Phi and Ko Lanta (both are in Krabi Province). Few ports in Phuket provide this service with fares ranging between 300 bahts and 500 baht. The trip may take 1.5 to 2 hours, depending on weather conditions. It costs approximately 20 baht / person / trip to travel around Phuket City. Alternatively, motorcycles can be rented from rental agencies located on Rasada Road or from several operators along beaches. The cost may vary from 150 baht 300 baht / day, depending on the number of cylinders. 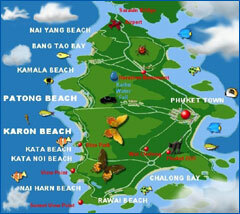 Songthaeos are operated along Ranong Road to several destinations on the beaches. The cost varies from approximately 20 baht to 25 baht / person / trip. Normally the service is provided from 7.00 a.m. until 5.00 p.m.
Tuk-Tuks can be chartered to the beach however, the rates which can be negotiated are higher at 200 baht to Patong Beach, 230 baht to Karon and Kata Beaches and 300 baht to Nai Han and Kamala Beaches. However, Tuk-Tuks drive around the town at the rate of 20 baht. Visitors can call 076 232157-8 to get a metered taxi that will take them anywhere in Phuket. The metered fare will include a 20 baht surcharge. There are regular bus services (VIP, air-conditioned and non-air-conditioned) to neighboring provinces such as Krabi, Phang-nga, Chumphon, Ko Samui (bus/boat), Nakhon Si Thammarat, Ranong, Surat Thani, Satun, Hat Yai, Takua-Pa and Trang. Departures are from the Phuket Bus Terminal off Phang-nga Road. For more up-to-date schedules and fares, call Phuket Air-conditioned Bus Station, tel. 0 7621 1977. There are shared taxi and van services between Phuket and other nearby provinces. Fares of both are generally around double the fare of an ordinary bus. The stations of both taxis and minivans are also on Phang-nga Road. Some domestic airlines operate flights from Phuket to Surat Thani, Nakhon Si Thammarat, Trang, Hat Yai and Samui. For more details, check with your travel agent or the TAT office. An old local port, it is from here that long-tail boats depart for nearby islands such as Ko He, Ko Racha Yai, Ko Mai Thon, Ko Lon, etc. The chartered price depends on the distance. The largest port of Phuket that has all kinds of boats, including cruisers of tour companies which organize package tours to other islands. Located near Phanwa Cape, the port is only for cruisers and container ships. Boat Lagoon Port (Ao Sapam) The port is for traveling boats of tour companies.